I love riding dual sport bikes into the woods. In my youth, I would curse and huff and puff when a fun paved road dropped the yellow diamond sign on me, illustrating a paved road disintegrating into dots of gravel ahead. But now it’s the exact opposite. The sign no longer means it’s the end of the road, but rather a new beginning — “Around the next corner adventure awaits”. 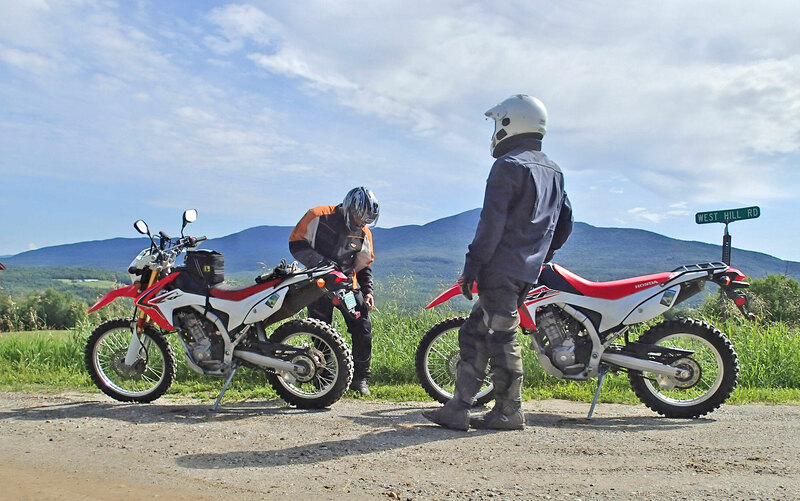 So when I was prepping for a road trip to the Adirondacks earlier this summer, a small ad for a company called MotoVermont caught my eye. Exploring their website revealed they not only rent out motorcycles for moto-tourists in the area, but they offer guided and self-guided on- and off-road tours too. 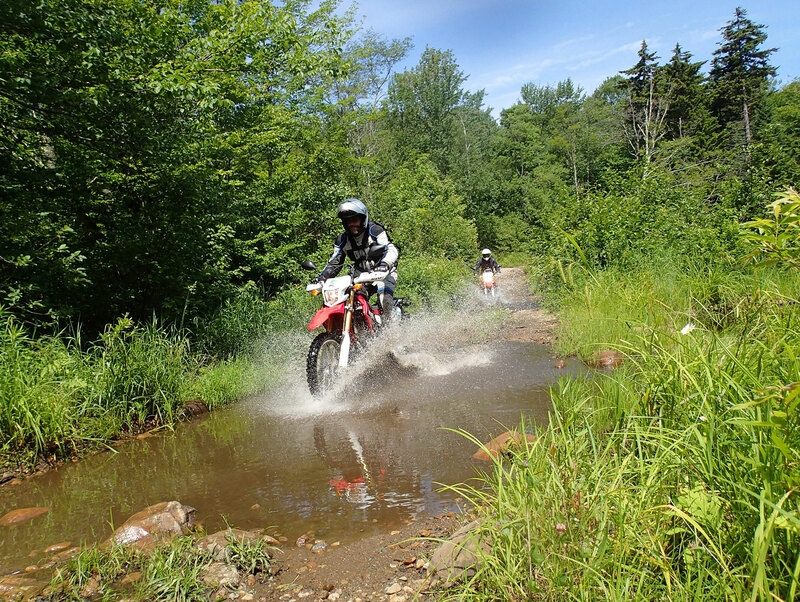 As much as I profess to my love of dirt, I had never thought Vermont would be a destination for off-roading. The prim, well-kept state is a joy to ride through, with its wide, farmed, valleys and notch roads over their tops, but it never struck me as an area for dirt riding. Unloading the bikes for the day. 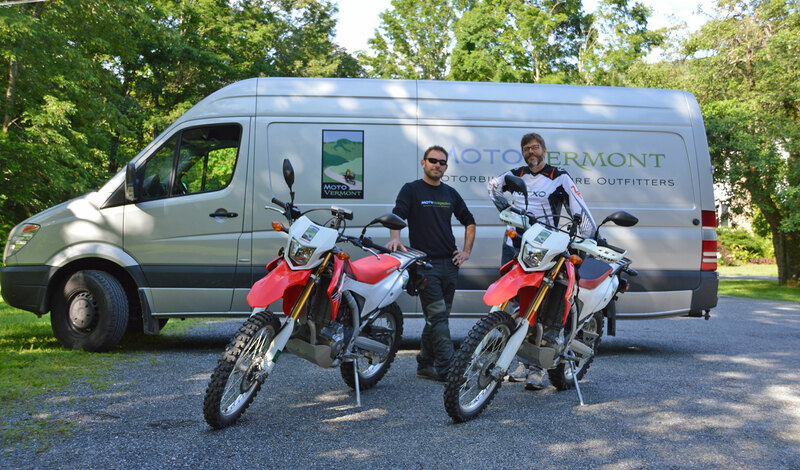 A month later, I was shaking hands with Eric Milano, owner of MotoVermont and off-road enthusiast. 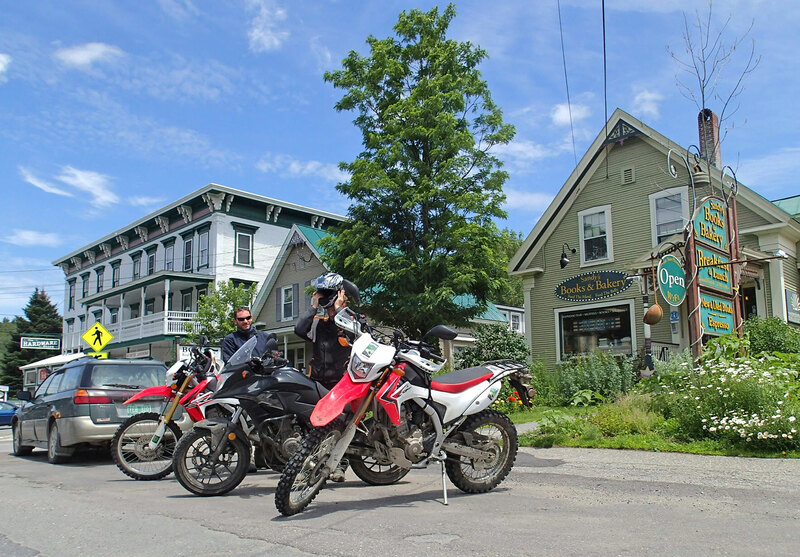 We’d arranged to meet at the charming Baldwin Creek Inn, just out of Bristol, Vermont — one of two locations Eric uses to meet his adventurist customers (the other, offering somewhat trickier terrain being Jay’s Peak). My riding partner for this tour was Jim Vernon, aboard a Honda CB500X, whilst I was on the long-term BMW R1200GS. 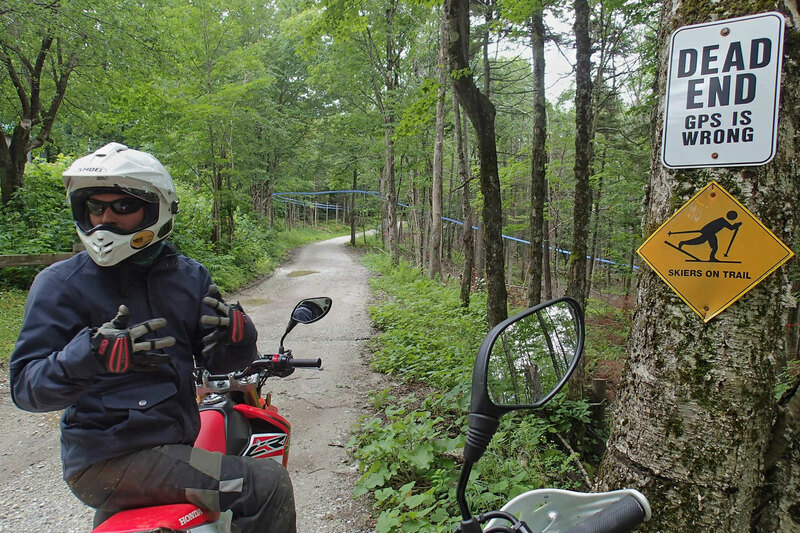 The original plan was to slap wire wheels and some knobbyish tires to the GS for the tour (with Jim adding suitable tires and some bash protection to his CB) so we could ride the MotoVermont trails as a day’s excursion along the way. Jim had prepped the CB500X as best he could. Lack of tire choices for the big GS ixnayed that idea and although Jim stuck with his CB, I opted to ride one of Eric’s CRF250Ls (KLR650s and BMW GS and RTs making up the rest of his rental fleet). 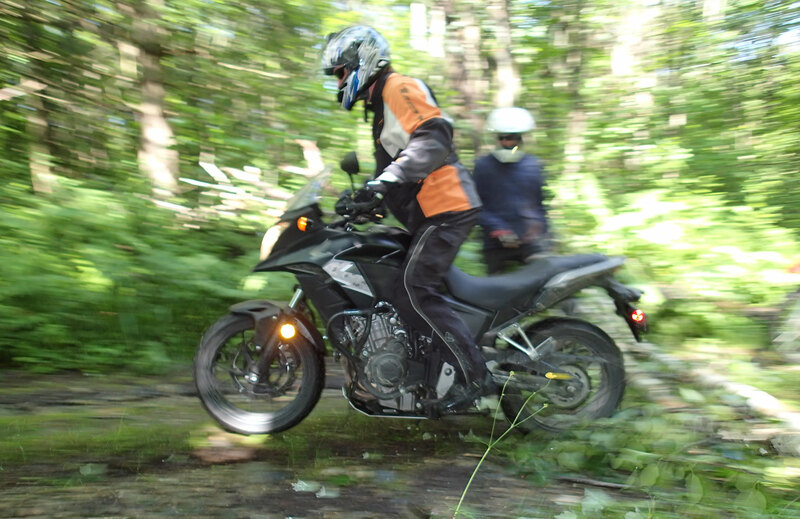 The little Honda meant we could explore some more “interesting” trails; whether Jim’s CB would cope was a question we all left unanswered. But that’s the beauty of Jim, he’s game to give it a go, even if it does sometimes involve a tow truck, hospital and a stint of physio, like our ill-fated Labrador expedition did. The tour for today was to explore the neighbouring Green Mountains area and we quickly found ourselves on postcard-worthy gravel roads that meandered through fine Vermont vista, dotted with charming New England hamlets. I forget what a treat it is to be led sometimes. No need to consult maps, keep one eye on a GPS or watch for road signs, just follow the leader. The pace wasn’t fast but there was no need, I was more than happy to just take it easy and absorb the scenery. Following the leader was quite the treat for me. My day had started with a stomach full of knots; fires at home and at work were proving hard to quell, but there’s something about how dirt/gravel roads have a knack for settling the soul. A good rip on the road can distract the mind, but the lack of traffic and everyday civilization, combined with the need to read the surface well, adds the extra heat needed to melt away the lumps clogging the mind. It was the ideal therapy and perfectly timed. A slow pace through easy gravel roads soon picked up as Eric confirmed we could ride, and as the day progressed we took on some more challenging roads. After lunch the clouds that followed me from the east coast of Canada to Vermont once again found us. It was raining when we hit the trail over Brantree Mountain; not overly challenging on a CRF250L, but definitely tougher on a CB500X. Jim opted to go first so we could help pick the bike up when he inevitably dropped it. It proved to be a bit of a masterclass of sheer determination as Jim slipped the X’s rear tire from one side of the trail to the other, desperate to keep forward momentum up the steep, rocky incline – no small feat on a bike with 1-inch rims. If Honda wanted to really push the X as a real adventure bike, all they need do is give Jim lunch and film what happens next. On the other hand, the CRF was effortless and fun. Light, agile and gently-powered, it offers an easy ride for a novice or a very capable companion for the more experienced. We returned to whence we started in Bristol, somewhat damper than when we had started, but the day had done its job. Eric packed up the two CRFs and headed back to base in Burlington while Jim and myself headed west to the ultimate destination of this tour: New York’s Adirondacks, but that’s another story. Eric’s found a gem in the hills of Vermont and done well to set up a business that fully capitalizes on its beauty and many sites of historical significance. But location is only one part of a good touring operation. The guide is also integral to its success. Calm, knowledgeable and ever enthusiastic to show off Vermont’s finest, he was also able to read us well and kept the pace and routing just right for a grand day out. Well recommended. Run by Eric Milano, the company came about after Eric sold his software company and was looking for a way to make his riding passion into a full-time business. 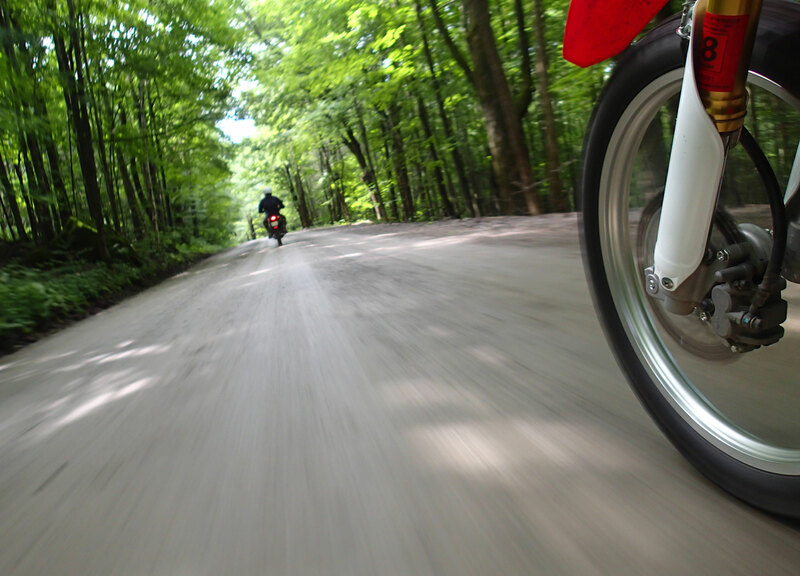 His main income source is through motorcycle rental with a fleet of BMWs and some dual sports, with most customers exploring New England and eastern Canada. Now, 2015 marks his fifth season in business, but he doesn’t hand the keys over to just anybody. High insurance premiums and the litigious nature of the US means he personally vets all potential riders first — a practice that has worked well to date (note to Eric: You need to do that with journalists too — that ‘Arris is a liability). His off-road guided tours are available by the day (that’s essentially what we did) but he also offers a three-day training tour that includes off-road training built into a tour, as well as more intensive tours from three and four days in length, including a mix of guided and self-guided days (all routes provided by GPS). On-road tours are self-guided only but come with GPS routes. For the person who wants to fly and ride, MV will pick you up at Burlington airport and offer riding gear, GPS and bikes for rent. All tours include insurance, accommodation and roadside assistance, but you are required to place a $1500 security deposit. 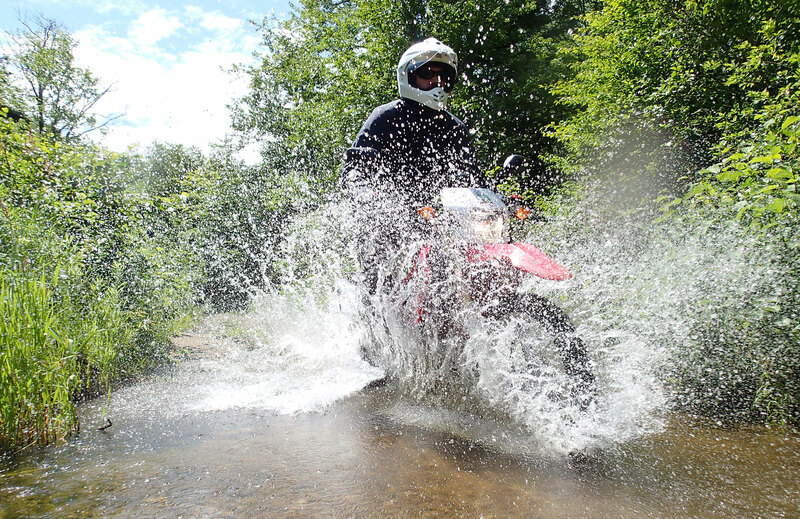 Honda’s 500 twin is versatile enough to serve in a sport bike, a naked bike, a cruiser, and this adventure bike. Looks like fun. Rob you must be getting old. When did you start riding the appropriate bike for the task at hand?